Hauppauge's most affordable satellite tuner card with DVB-S2 compatibility, the Nova-HD-S2 can be upgraded for pay-TV reception with a USB-interfaced CI 'dongle'. It benefits from a remote control, which drives the supplied application. 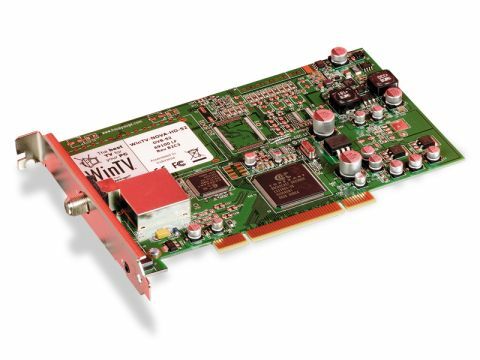 This used to be Cyberlink's PowerCinema – which also featured DVD/media playback but had numerous digital TV limitations and so Hauppauge now supplies its own WinTV 7. Compared with the Azurewave AD-SP400, connectivity is minimal. The backplate, which is accessible from the rear of the PC after the card has been slotted into a spare PCI slot, sports an 'F' connector for your dish and a 2.5mm remote-sensor input jack. Installation on our test Vista PC was headache-free. As with the other tested cards, the Nova-HD-S2's drivers are BDA-compliant and thus compatible with third-party digital TV applications like DVBViewer Professional and TSReader. A downloadable patch allows you to use the Nova HD S2 within Microsoft's Windows Media Center. Compared with PowerCinema, which aped MCE quite well, WinTV is basic, but it's fairly easy to use. In addition to timeshift and recording, it offers now-and-next and 7-day EPG support, a teletext decoder (which failed to start), an unlimited number of timer events and MPEG conversion. With WinTV, the Nova-HD-S2 is no speed demon. It took half an hour to find a mere 218 (out of more than 1,000) DVB-S and DVB-S2 channels on the Astra 2x cluster. None of the usual British FTA channels could be found – with the ironic exception of ITV HD, which usually troubles receivers (including the three other tuners here). Picture and sound quality were both fine, though. DVBViewer Professional yielded far superior results finding all of the channels that cluster could offer in less than five minutes. That we found so few channels to start off with pointed to a sensitivity problem. However, the use of DVBViewer demonstrates that the Nova-HD-S2 fares no worse or better than other recent internally fitting tuner cards.